The black vulture (Coragyps atratus) also known as the American black vulture, is a bird in the New World vulture family whose range extends from the southeastern United States to Central Chile and Uruguay in South America. Although a common and widespread species, it has a somewhat more restricted distribution than its compatriot, the turkey vulture. Despite the similar name and appearance, this species is unrelated to the Eurasian black vulture. The latter species is an Old World vulture in the family Accipitridae (which includes eagles, hawks, kites and harriers), whereas the American species is a New World vulture. It is the only extant member of the genus Coragyps, which is in the family Cathartidae. It inhabits relatively open areas which provide scattered forests or shrublands. With a wingspan of 1.5 m (4.9 ft), the black vulture is a large bird though relatively small for a vulture. It has black plumage, a featherless, greyish-black head and neck, and a short, hooked beak. The black vulture is a scavenger and feeds on carrion, but will also eat eggs or kill newborn animals. In areas populated by humans, it also feeds at garbage dumps. It finds its meals either by using its keen eyesight or by following other (New World) vultures, which possess a keen sense of smell. Lacking a syrinx—the vocal organ of birds—its only vocalizations are grunts or low hisses. It lays its eggs in caves or hollow trees or on the bare ground, and generally raises two chicks each year, which it feeds by regurgitation. The black vulture is a fairly large bird of prey, measuring 56–74 cm (22–29 in) in length, with a 1.33–1.67 m (52–66 in) wingspan. Weight for Black Vultures from North America and the Andes ranges from 1.6–2.75 kg (3.5–6.1 lb) but in the smaller vultures of the tropical lowlands it is 1.18–1.94 kg (2.6–4.3 lb). The iris of the eye is brown and has a single incomplete row of eyelashes on the upper lid and two rows on the lower lid. The legs are greyish white, while the two front toes of the foot are long and have small webs at their bases. The feet are flat, relatively weak, and are poorly adapted to grasping; the talons are also not designed for grasping, as they are relatively blunt. The nostrils are not divided by a septum, but rather are perforate; from the side one can see through the beak. The wings are broad but relatively short. The bases of the primary feathers are white, producing a white patch on the underside of the wing’s edge, which is visible in flight. The tail is short and square, barely reaching past the edge of the folded wings. In South America, its range stretches to central Chile and Argentina. It also is found as a vagrant on the islands of the Caribbean. It prefers open land interspersed with areas of woods or brush. It is also found in moist lowland forests, shrublands and grasslands, wetlands and swamps, pastures, and heavily degraded former forests. Preferring lowlands, it is rarely seen in mountainous areas. It is usually seen soaring or perched on fence posts or dead trees. 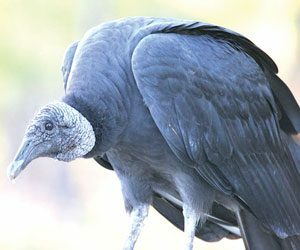 The black vulture lays its eggs on the ground in a wooded area, a hollow log, or some other cavity, seldom more than 3 m (9.8 ft) above the ground. While it generally does not use any nesting materials, it may decorate the area around the nest with bits of brightly colored plastic, shards of glass, or metal items such as bottle caps. Clutch size is generally two eggs, though this can vary from one to three. The egg is oval and on average measures 7.56 cm × 5.09 cm (2.98 in × 2.00 in). The smooth, grey-green, bluish, or white shell is variably blotched or spotted with lavender or pale brown around the larger end. Both parents incubate the eggs, which hatch after 28 to 41 days. Upon hatching, the young are covered with white down. Both parents feed the nestlings, regurgitating food at the nest site. The young remain in the nest for two months, and after 75 to 80 days they are able to fly skillfully. Predation of black vultures is relatively unlikely, though eggs and nestlings are readily eaten if found by mammalian predators such as raccoons, coatis and foxes.